In the past few weeks, we had been very busy with some family weekend activities. I make it a point to do something with J and K to create some exciting, memorable experiences… rather than shower them with materials such as toys and gadgets or being a couch potato. When I mention exciting, memorable experiences… they don’t need to be exotic or expensive. My wife’s employer organized its annual family day and this year it was held in an outdoor park. I must say this place is awesome and if you are a nature lover, you will agree with me too. 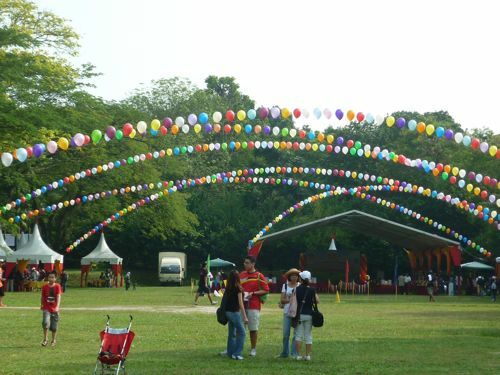 Not only that, the organizer had done an excellent job by lining up endless activities and performances to keep the employees and their family members occupied and entertained. There were activities like face painting, sand art, air paint, caricature, and above all, K’s favorite: pony rides. 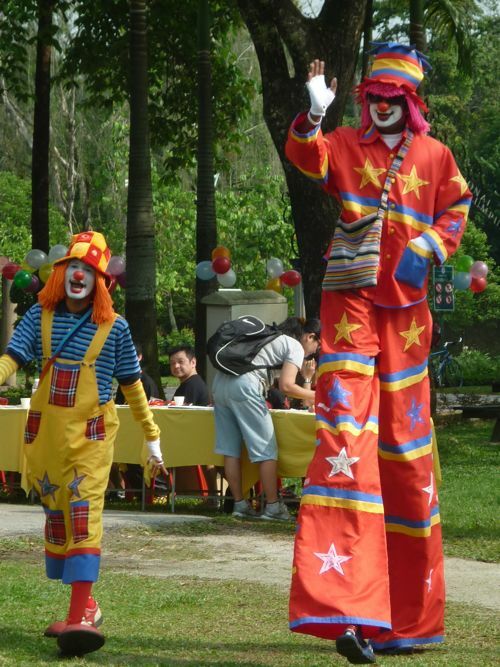 To make the event even more lively and fun, the organizer brought in at least 8 clowns and stilt walkers. 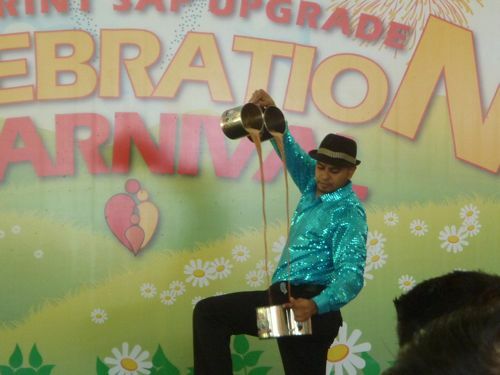 Some interesting shows were also included: teh tarik performance, magic show, and limbo rock by King of Limbo Rock Malaysia. And for game junkies, they didn’t have a chance to get disappointed. Ten games were lined up for them. And each successful attempt at the game entitled you a stamp. Based on the number of stamps you collected, you could exchange for a soft toy. The fun part was the organizer made it easy for the participants to win prizes. Nobody would feel left out. Naturally, J and K were having a lot of fun winning despite the hot weather. At the end of the day, our car was full of toys and goodies. For lucky draw, my wife got a RM30 Jusco voucher. Our monthly trekking was in Semenyih this time. After the trekking, we took the opportunity to visit Look Out Point in Ampang. 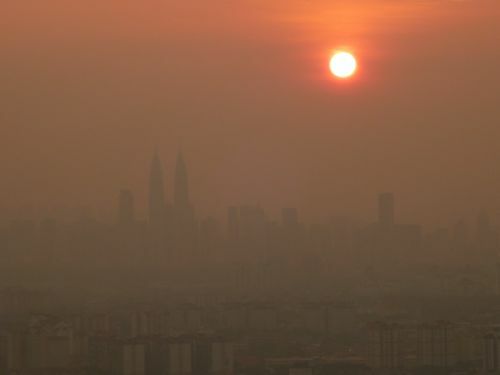 We heard that the place is ideal for KL skyline at night. We went there with Teoh’s family and Tony’s family – with 4 children, one baby. Besides a place for night view, Look Out Point is a place for dinner too. There are about 5 restaurants there (if I remember correctly) and one can have a romantic moon-lit dinner with loved ones (I noticed many lovebirds like to hang out there) overlooking KL’s night view. You can park your car at the bottom of the hill and walk up to the top using the steps provided. If you are lazy, you can drive up (but space is limited) and I understand that the parking fee is RM5 up there. After taking a short tour of the place, we finally settled at Panaroma Restaurant – simply because it has an observation tower in the middle of the restaurant. For us parents, Look Out Point is more for the night scene of Kuala Lumpur. But for the kids, they enjoy running up and down the observation tower. Panaroma offers fusion food. The food there is average but pricey. Costs: Free entrance. Car park is RM2 per entry at the bottom of the hill. What made me want to go partly was the art, also partly the venue. The art exhibition is held at an underground gallery at Rimbun Dahan. I wanted to check out this place for quite some time already. 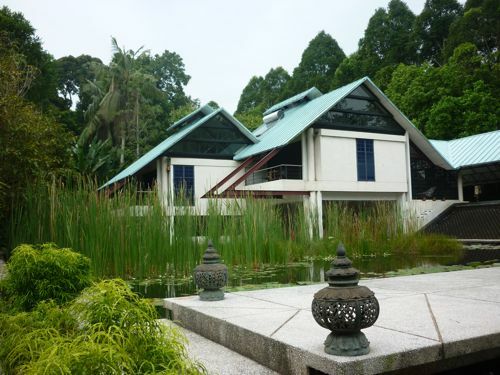 Rimbun Dahan is the home of Malaysia’s famous architect Hijjas Kasturi. It is a private property but he and his wife Angela Hijjas are kind enough to open it to the public for the purpose of charity. All proceeds from the sale of the exhibition will go to WWF. It is indeed what I expected. The place is a nature’s sanctuary surrounded by trees, birds, insects, and everything you can find in a small forest. It’s cooling and serene. But watch out for mosquitoes though! 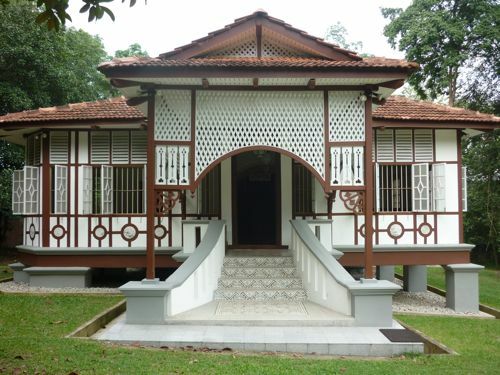 Besides the main building (Hijjas’s home), there are three traditional restored Malay house right at the back of Rimbun Dahan compound – namely Penang House, Rumah Balai, and Rumah Uda Manap. 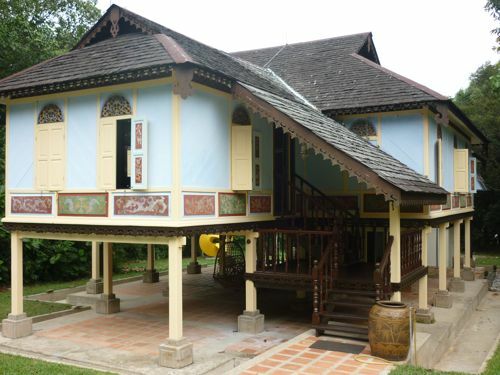 We had a nice tour there and were amazed by the design and architecture of the ancient Malay houses. We happened to be around the neighborhood of my best friend, KMK. We took this opportunity to visit him and of course his wife and his two children. J and K had met my friend’s children a few times before this. Unlike previous encounters, this time they didn’t need time at all to warm up to each other and all of them just dived in and played together. Boys with boys, girls with girls. This is something I have been waiting for. I want my children to be able to interact and socialize with people with ease. It has shown some improvement now. Later, we proceeded to have dinner together. My friend paid for the dinner. Sweet. This is probably the biggest event not only J and K attended but me. 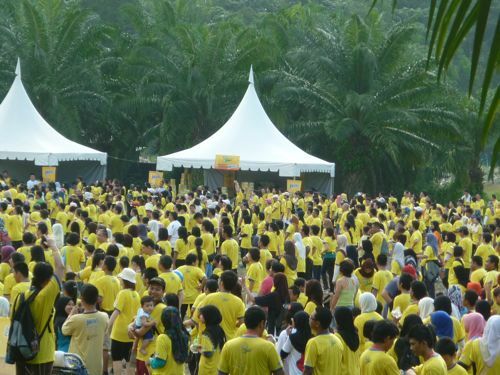 If I am not mistaken, Jacob’s Walk of Life 2011 has attracted a strong 7,000+ crowd who took part in this annual event which was organized by Jacob’s – the biscuits maker. 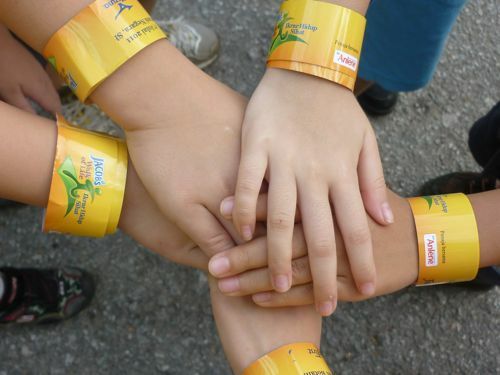 When I got to know about this event from a friend, I quickly registered the whole family. For those who registered online, they would get free goodie bag and T-shirt. Walk-in participants are welcome as well. This is exactly what my brother Eric did. Besides him, we were joined by two other families: Teoh and Lam. On the day, I was blown away by the crowds when I reached Taman Botani Negara Shah Alam (formerly Taman Pertanian Malaysia) at about 7:15 am. The cars were everywhere. I didn’t have the chance to get near the main entrance of the event. I had to park my car quite a distance from it. In the end it turned out to be a good thing because the cars which parked near the entrance caused a very bad traffic jam by the time the walk was over. Here is a tip if you go next year: go there early but don’t park near the entrance (preferably before the arch) so you can leave the place smoothly without the congestion. It was a fun-filled event. The children (5 of them plus a 9-month old baby) enjoyed each other’s company and they had a lot of fun. They did very well too. We didn’t take shortcut and hop on the bus. We completed the 6 km path. It took us more than 2 hours to complete the walk because we did it at a leisurely pace. Minus some minor complaints and fuss, J and K were doing awesomely well overall. I am impressed with their determination and persistence. Reward after the Walk: Ice-Cream! Note: If you have not been there, give Taman Botani Negara Shah Alam a try. A great place to connect with Mother Nature and there are plenty of activities you can do there: paint ball, cycling (bicycles for rent available), and more. For subsequent two weekends, J is invited to two birthday parties by her classmates. So J’s weekends are pretty occupied already for July. Going to birthday parties is not really free though because we can’t go there without a present, can we? While J is away having fun at the parties, I am thinking of taking K to his classmate’s house so that he can have his share of fun too.